From 2001 to 2009, the New Mexico Bureau of Geology and Mineral Resources joined with several state and local governmental agencies and organizations to conduct a series of field conferences for influential New Mexico decision makers. The purpose of these conferences was to present decision makers with the opportunity to learn first-hand about geological problems, opportunities, and potential solutions from some of the state's top experts, and to hear impartial (or at least balanced) opinions regarding current scientific knowledge about these matters. The conferences were accompanied by field guides, which contain a series of short articles written by noted authorities. The books provide a timely look at issues that affect every New Mexican, and remain a valuable educational resource long after the conferences are over. The guidebooks from all the conferences to date are available to the public as inexpensive printed books and as free PDF files. 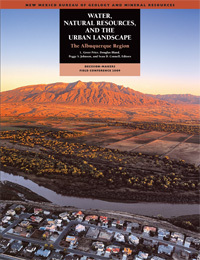 The 2009 field guide provides a broad overview of geologic and resource management issues related to the rapidly growing Albuquerque metropolitan area. 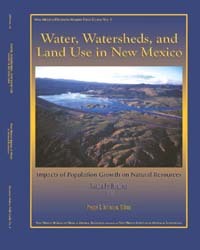 The 23 individual papers, written for a general audience, address the most critical of these issues, including water supply strategies for the future, geologic hazards of the Albuquerque area, saline waters and deep, non-potable aquifers, and flood control challenges. 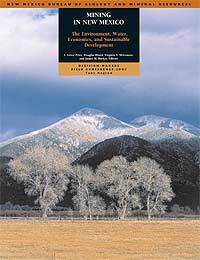 Several articles provide a broad overview of the geology and hydrology of the Albuquerque region. 152 pages with full color photographs, maps, illustrations, diagrams, tables, and a separate fold out map of the draninage facilities in the Albuquerque Metropolitan area. (requires version 8 or greater) Note that the electronic version excludes some material. There is no subject of greater interest to New Mexicans than water—where we get it, how we use it, and how it is managed. This volume provides a broad overview of issues related to water resources on the Middle Rio Grande. 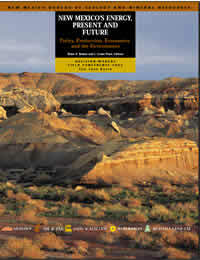 But this timely collection of 25 articles addresses critical issues of statewide importance, including: surface water management and infrastructure; the physical, biological, and historical framework; the legal challenges that lie ahead; agricultural-to-urban water transfers; opportunities for long-term bosque preservation; and forging a stustainable water policy for the Middle Rio Grande. 140 pages with full color photographs, maps, illustrations, diagrams, and tables throughout. (requires version 6 or greater) Note that the electronic version excludes some material. Mining has played a significant role in the history and develop- ment of New Mexico and continues to play an important role in the state's economic prosperity. The future of this industry will depend upon achieving a balance between our needs and desires, the changing economy, and our growing concern over environmental and social issues. This anthology of 30 articles is a timely look at some of those science and policy issues. 176 pages with tables, diagrams, maps, and color photographs throughout. Water in New Mexico is a complex and important issue. Nowhere is that more true than on the Pecos River in eastern New Mexico. This anthology of 30 short articles is a timely look at water issues along the Pecos River, from Sumner Lake to the Texas state line. 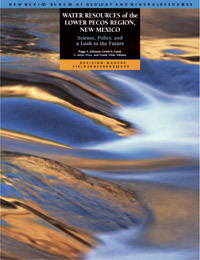 Produced in conjunction with the third annual Decision-Makers Field Conference in October 2003, this volume is an authoritative look at the historical framework and a summary of where we areand where we're goingon the Pecos River in New Mexico. 145 pages, tables, graphs, and illustrations, color photographs, and page-size maps. Note that the electronic version excludes some material. New Mexico, with some of the most significant energy reserves in the lower 48 states, is a major player in this country's conventional energy production. The state also has enormous potential for developing significant renewable/alternative energy resources, including solar and wind. This anthology of 30 articles is a timely look at how energy works in New Mexico today, with an eye toward the promises and challenges that lie ahead. 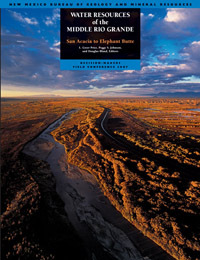 Produced in conjunction with the second annual Decision-Makers Field Conference in may 2002, this volume is an important contribution to the literature on energy in New Mexico. 152 pages, 47 tables, graphs, and illustrations, 32 color photographs, and 23 page-size maps. Note that the electronic version excludes some photo material. This publication is out-of-print. It is available on CD or DVD-ROM.